A lot can change in the 454 days between now and Ireland's World Cup opener against Scotland in Yokohama, but at this remove it is impossible not to feel optimistic about what Joe Schmidt's side can achieve in Japan. The evidence was inconclusive, the hooter sounded and the Lansdowne Cup was added to the team's luggage for the flight home. He has kept an eye on events elsewhere and noted the improvements of his rivals. 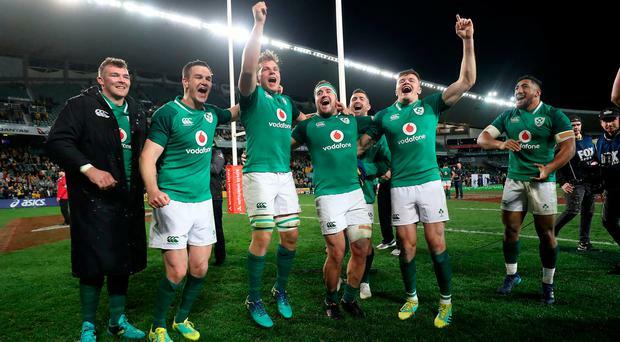 Everyone is ramping up for 2019 now and Ireland's mission is to build on this success once they have taken a breather at the end of a relentless year. "I'm kind of intimidated by the season because how do you repeat that?" Schmidt said. "It's tough to go again and with that expectation. We have that expectation of ourselves that we're going to try to keep working and try to keep improving. "We don't want to be one hit wonders, but while we have earned where we are right now, in the scale of things we want to keep growing. Including the June tour last year, Schmidt has handed out 14 new caps while winning all but one match and his investment in youth has paid dividends. That was summed up by Jordan Larmour's hugely influential role in the finish. While everyone about him looked fatigued, the 21-year-old was hungry for the ball and as the tide turned against his team he refused to give; winning a high ball above Israel Folau, eking out hard yards with his footwork and his energy lifting those around him for a final hold-out. Schmidt's newest cap, Tadhg Beirne, played a role as well and while they lost their captain before the tour and their stand-in midway through the first half, they never missed a beat. Michael Cheika invited the French official into the press conference to explain some of his big calls including the decision to issue Folau with a yellow card, penalise Tolu Latu for Johnny Sexton's insurance score and the big one at the end but, not surprisingly, he declined. Across the summer series, refereeing and the role of the Television Match Official has been a controversial topic and World Rugby have a job on their hands to prevent officiating being the major influence on proceedings at next year's big show. Aussie ace David Pocock said: "Credit to Ireland through the series, they have been tough. "Their game management has been really good, you don't become No.2 in the world for nothing, it finishes a really good year for them. But for us, it's really disappointing." Having dealt with injuries, the late withdrawal of Sean Cronin and a delayed bus journey that conjured up memories of last year's Murrayfield disaster, Schmidt can be happy with how this pre-World Cup stress test has gone. In August, he'll regather the troops in Carton House and task them with improving. Australia: I Folau; D Haylett-Petty, S Kerevi, K Beale, M Koroibete (R Hodge 69); B Foley, N Phipps(J Powell 61); S Sio (T Robertson 61), B Paenga-Amosa (T Latu h-t), S Kepu (T Tupou 57 q); I Rodda (N Hanigan 72), A Coleman (R Simmons 45); L Tui, M Hooper (P Samu 16), D Pocock. IRELAND: R Kearney (J Larmour 58); K Earls, R Henshaw, B Aki, J Stockdale; J Sexton, C Murray; J McGrath (C Healy 56), N Scannell (R Herring 56), T Furlong (John Ryan 65); D Toner, James Ryan; CJ Stander, P O'Mahony (capt) (J Murphy 31), J Conan (T Beirne 69).